From the release of the first Lord of the Rings film in 2001, Mr Boo. was captivated by the story and with the release of the subsequent films and later The Hobbit trilogy. Over the years we have been to see each new film at the cinema, and have collected several memorabilia pieces such as the limited edition pieces that came with the original DVD release. 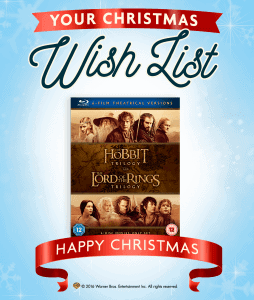 As Christmas approaches the subject of what to buy a Middle-Earth fan springs up and I have been looking for different gift ideas on what you could buy. Gather all six films from director Peter Jackson’s ‘The Lord of the Rings’ and ‘The Hobbit’ trilogies in one boxset. Set in Middle Earth 60 years before events in ‘The Lord of the Rings’, ‘The Hobbit: An Unexpected Journey’ follows the adventures of hobbit Bilbo Baggins, who, at the instigation of the wizard Gandalf, suddenly finds himself co-opted into joining a company of 13 Dwarves led by Thorin Oakenshield to help reclaim the dwarves’ lost kingdom of the Lonely Mountain from the clutches of a dragon. In ‘The Lord of the Rings: The Fellowship of the Ring’ Frodo is a hobbit living in the Shire, a quiet, peaceful part of Middle Earth. When it turns out that his elderly relative Bilbo is harbouring the ultimate Ring of Power and the evil Nazgul riders of Sauron are coming to find it, Frodo is entrusted by wizard Gandalf to deliver the Ring out of the Shire without it falling into their hands. 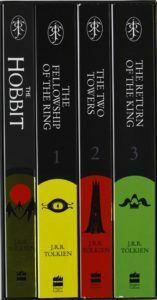 This new boxed set, published to mark the 75th anniversary of the publication of The Hobbit, offers readers a new opportunity to discover Tolkien’s remarkable world of Middle-earth and to follow the complete story of Bilbo Baggins and the Hobbits’ part in the epic quest for the Ring – beginning with Bilbo’s fateful visit from Gandalf and culminating in the dramatic climax between Frodo and Gollum atop Mount Doom and Bilbo’s departure to the Grey Havens. Frodo, Sam and the fellowship travelled many, many miles across Middle Earth. 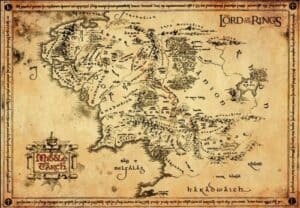 This parchment map showcases the journey which took them to Mordor to destroy the Ring of Power. Whether you are a keen chess player or not, this Lord of the Rings 3D chess characters set will look amazing set up on your sideboard. You are sure to gain many comments about it from family and friends when they come to visit.